Can't shake the anger? How to be vulnerable and reset with your kids. Can’t shake the anger? How to be vulnerable and reset with your kids. If we’re being honest, it can be hard at times to stay patient as a parent. It’s not something that we are technically trained to be prepared for, right? There isn’t some magic handbook out there or step-by-step guide…but wouldn’t it be nice if there were? Imagine being able to turn to page 65 in the handbook to get instructions on how to handle the situation of an out of control child screaming at the top of their lungs (called “Ear throbbing Scream-itis in said imaginary handbook). Sounds pretty awesome. But comically unrealistic too. The beautiful and wonderful part of being a parent is that we get to love and support our children through the journeys of their life. We get to be involved, be active and be their cheerleader and watch them grow and lead a healthy, happy and loving existence. The hard part about being a parent? We also have to be the ones to discipline, correct and lead by example for their journeys as well. Sometimes, we feel frustrated. Sometimes, we may get downright angry. The key to being able to reset after being angry is to understand how to do so. If you are feeling that you need a reset for your attitude, don’t dwell on it but make it a priority to understand it, move forward and reset your mentality into a positive one. 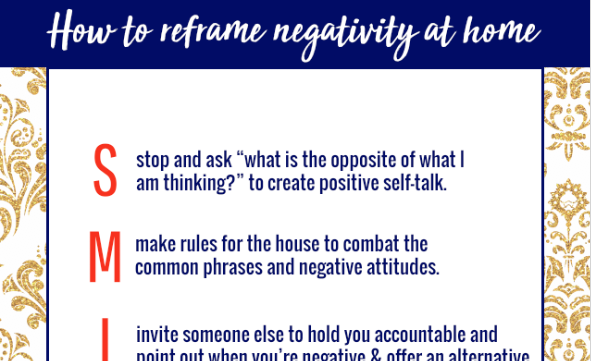 Grab your free “reframing negativity at home” download. Talk it out with your child. 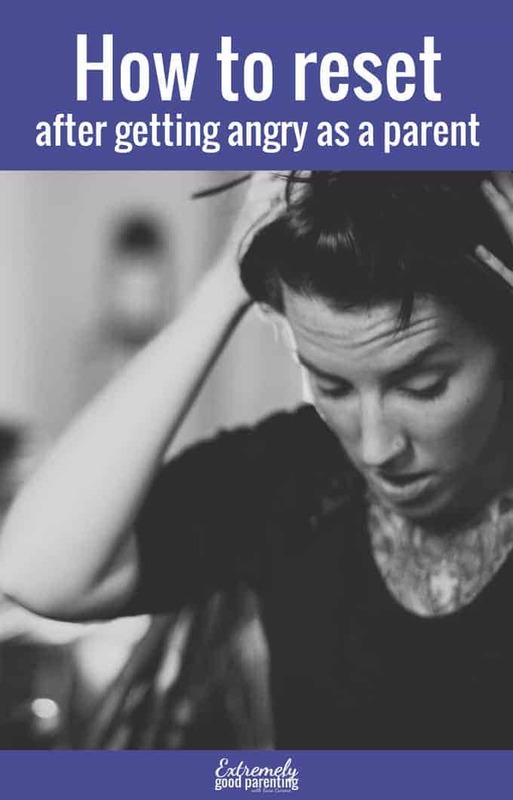 While admitting that you went overboard with your frustration or anger is not an easy thing to do, it’s important to have that conversation with your child. They learn from you, remember? If you don’t acknowledge and recognize that what you do was not handled correctly, how can you expect them to learn how to handle their emotions any differently than the way you show yours? Talking it out also allows you to explore the real root reason of why you may be feeling angry and might be just what you need to recognize it, so you won’t make the same action out of anger again. Sometime talking it out is lame. Ha, seriously though. While sometimes necessary, it’s not always healing. But vulnerability can truly lead to healing. When we show our failures and open up in tears, in laughter, in dance, or some other form of expression we are opening a wound or allowing ourselves to be wounded. It creates an environment for a deeper connection with each other, making it hard to not only stay angry, but also for our loved ones to be upset with us. It also helps our kids learn about processing their own emotions. Actions can speak louder than words. If you showed actions to your child that made you seem angry, show them actions that make them feel loved. Sit next to them on the couch, and just hold one another. Silence can be fine at times such as these. Not all solutions have to be solved or figured out immediately. Sometimes, in times when we may have acted out in a negative manner, we just need a bit of space. Go for a walk, separate yourself from others for a short time to process your thoughts or just take a seat in another room. Giving yourself a mental break from all the thoughts running through your head can be a much-needed way to find the thoughts to then be able to reset. Many times anger can actually stem from a fear that we may be having. Ask yourself that hard question, and dig deeper to give yourself an answer. Once you can understand what you are fearful of or afraid of, you may then be able to confront it to overcome it and allow that anger to subside. Sometimes we have fears of our kids being entitled. Maybe fears of our kids getting hurt from a stupid decision. Or even fears of them walking the same road we did once. SO yes, your own fears can play into anger in parenting. Ask for help from your spouse. We’ve all heard the phrase that parenting takes a village, right? There are times when we may be feeling as though we can’t handle another question, or change another diaper..and we need that help. We need that village. 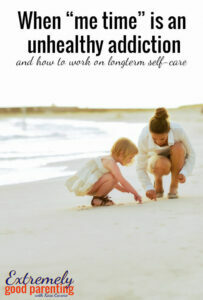 If you feel yourself needing that time, ask for help from your spouse, your family and/or your friends. You don’t have to suppress feelings of stress until the point when anger rears its head. If you have the options for help, they are there for you. Need to reframe negativity for your family? Using the word “SMILE” this is a cheat sheet on how to reframe negative thoughts and words into something more positive for the family to focus on. And it’s an immediate shift from negative to positive! I love these insightful suggestions that really get at the heart of what is happening for the parent and how to reframe anger outbursts for the whole family.